Free bike parking for motorcyclists could be scrapped nationally because information needed to oppose the move has been kept from riders, according to campaigners. Under law people have six months to object to new parking charges for motorcycles becoming permanent. But public notices telling riders vanished within days of the charges being introduced. A campaign group says motorcyclists across the country will lose long-standing free bike parking bays unless the scheme in London’s Westminster is stopped. Since August riders have had to pay £1.50 a day to park in Westminster’s motorcycle bays or face a fine of up to £80. Signs appeared briefly in the bays giving the address of a company contracted by Westminster City Council to “collate objections”. Riders who missed the notices are likely to have instead emailed or posted objections to the council’s offices. Now the council says anything received in this way will not be included in the formal objection process. The council’s website makes matters worse by telling riders they can object but giving no address. Common sense would dictate they email or write directly to the council. Campaign Group No To the Bike Parking Tax, behind a series of protest rides against the charges, urged riders to object on the council’s terms before the six months is up on February 18. The group’s chairman Warren Djanogly said the scheme was certain to be copied by other towns and cities if allowed to go ahead. He accused Westminster Council of “acting in a way just to help them get this through”. “It’s hard to see that they genuinely want to consult bikers,” he added. A Westminster Council spokeswoman said emails or letters to council offices would be seen as “complaints” which would be taken into consideration but not included as formal objections when deciding whether to keep the charge. She said no address was given on the council’s websites because the signs in bays had been deemed sufficient. “We’ve found that the most effective way of informing people of a change to something that they use is to sign the actual service that they’re using,” she said. The spokeswoman said the message should quote the reference 5030/ALJ and say ‘motorcycle parking charges’ in the subject line. Postal objections should be sent quoting the same reference to Martin Low, West One, 59 Buckingham Gate, London SW1 6AJ, quoting reference 5030/ALJ. Djanogly urged motorcyclists to join the campaign’s next protest ride, from the Ace Café in Wembley to the MCN London Bike Show at Excel on February 1. 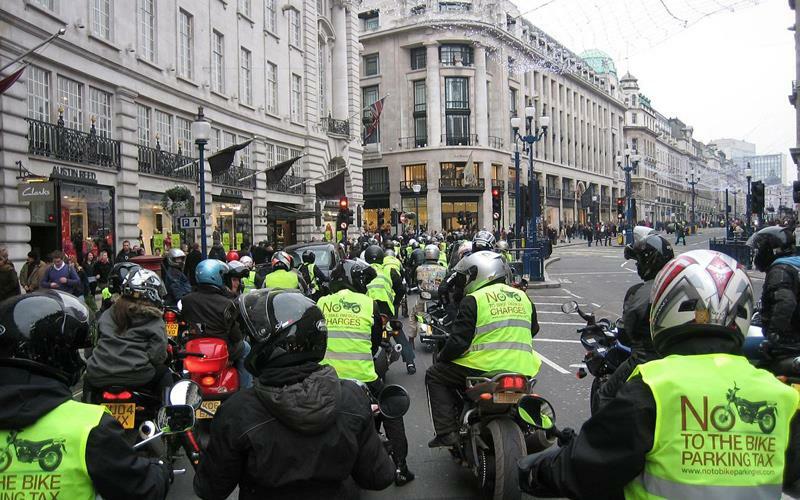 Get details on the protest ride and campaign plans at www.notobikeparkingfees.com. And on the MCN London Motorcycle Show at www.londonmotorcycleshow.com.